The four adaptation of the X-Men Series returns again in Wolverine and the X-Men: Deadly Enemies, and I have to say that this volume is one of the best compilation of episodes yet. I heard and read many complains about how Lions Gate, Nickelodeon and Marvel are delivering this series with only 5 episodes DVDs, and I can not agree more with them. It is a rip off, the series is great, each episode is beautifully animated and the stories are engaging and entertaining, but only five episodes? It seems just not enough for its price, at this rate just for the first season there will be a total of five DVDs. However, I got to say, that these Five Episodes in my opinions are worth it. 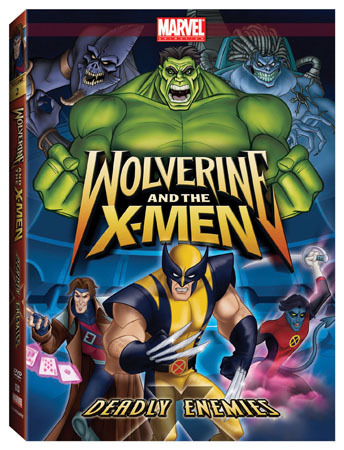 In this episode the X men team begins to take shape, with the introduction of key characters such as Nightcrawler, The Gambit, and Storm, however what makes this DVD better than its predecessor is the villains. Each episode has a live in their own, presenting an epic battle between good and evil. Foes like the Shadow king, Mojo, and Gambit test Logan and his X-men, but with out a doubt the special appearance of Fury and of course the Incredible Hulk, it definitely adds a plus to the DVD. It was fantastic how this episode was adapted to the previous encounter between the green giant and Wolverine. The last episode Time Bomb had a direction that previous X men episodes lacked, which is somehow shocking but at the same time somehow realistic. Having seen the series in TV I had to say that this is the Second best X-men series falling behind to 1992 X-Men the animated Series, however, it is logical that its animation is better than the 1992 classic, its characters are as appealing as the comic books, making each episode highly entertaining. In Deadly Enemies we see a greater sense of teamwork among X-men, since this time around, Logan is not the only problem solver, instead many supporting characters step up to his aid by displaying their unique and awesome powers. Nonetheless, story wise as in this first volume it does not seem that the actions in each episode are actually affecting the outcome of the real story. It is hard for me to recommend the DVD in a sense that it let you with a sour taste for the amount of episodes. As a fan I think this DVD is worth to have for the episodes and enemies presented, also because the episodes can stand alone from the series. However if you are a fan of the series I seriously advice you to wait for the box set to come out. SPECIAL FEATURES: The DVD‘s special features as its first version is nothing to be impressed, it consist only of an audio commentary and commercials.